It’s that time again, and you're expecting new orders soon. It’s daunting, I know, but research is the key to reducing stress and feeling like you have some control over your next PCS! There are 5 important questions to ask yourself when you are researching your next military home. 1) Is the neighborhood family-friendly? This is an important factor, regardless if you have kids or not. If you have kids, it will be nice to have other neighbors and kids for your family to interact with. If you do not have kids, it’s nice to have neighbors you know that can help you out by watching your dog, picking up the mail, or just someone to watch the house as you come and go. I love a neighborhood where kids are playing in the yards, neighbors wave as they drive into their driveway, and people are out and about at different times during the day. 2) Does the neighborhood have an HOA, social committee, or just a social atmosphere? If the neighborhood has a social committee, it’s fun to hang out and socialize with other people in your neighborhood. Sometimes being in the military can be lonely, so this is a great way to get out and meet new people. It gives a feeling of community, and many military families need this sense of community as their service member frequently comes and goes. 3) Is the neighborhood safe? This is the most important question you can ask yourself. I recommend you drive by the neighborhood at different times during the day and night. Ask a random neighbor what the neighborhood is like, and, believe me, they will tell you the truth. If you can’t drive by the house because you are miles away, look at the surrounding area on Google Earth. You can tell a lot about a neighborhood by what the surrounding homes and businesses look like. Also, read reviews on Military Town Advisor and see what other military families have to say about the neighborhood. 4) Is the neighborhood located near base? How long will the service member be commuting to and from work? This is an important question, and the answer can be very different for different families. For example, some military families would trade a longer commute for a home located further from base where they can get more square footage for the price. On the other hand, another military family might settle for a smaller house closer to base to reduce commute times. There isn’t a wrong answer; just make sure you know which side of the fence your family is on. Look for homes for sale or rent on MilitaryByOwner by entering the state and base name and see what’s available near base. 5) Is the neighborhood located in a good school district? Homes located in a good school district usually have better resale and are located in nicer areas. Make sure to know the school boundary lines and research the school on Great Schools. Take a deep breath and get to researching! I promise it will make you feel better in the long run! Do you have experience to share with other military families about a particular base, neighborhood, and more? 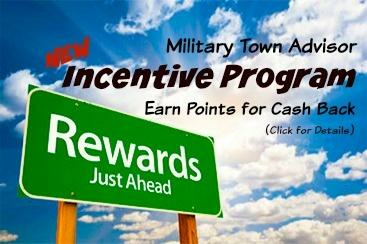 Click below to leave reviews on Military Town Advisor and earn rewards! Military Town Advisor is a PCS resource helping military families before, during, and after a PCS. Before your move, search for where to live, school ratings, and read military housing reviews. During your move, find a real estate agent and homes for sale or rent. After your move, explore your town by learning about great local businesses and fun things to do! Military Town Advisor is created by a military spouse to help other military families!